Adobe has released a service formerly code-named Cocomo (Common Collaboration Model), shortly thereafter was renamed Adobe Flash Collaboration Service and is now officially part of the LiveCycle family, being called Adobe LiveCycle Collaboration Service. LCCS is intended to function as a SAAS (Software as a Service) to simplify and facilitate the development of RIA applications based on multimedia. Enables architects and developers to create user experiences more engaging and more dynamic supporting multi-user, real time collaboration to new or existing RIA applications. Easily integrate text chat, whiteboard, webcam, and VoIP functionality. 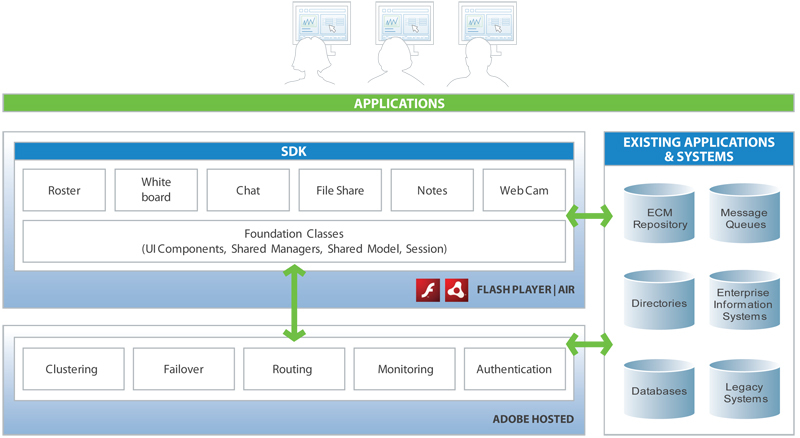 Rapidly build and deploy applications with the complete SDK. Manage user and session data. To start using the LCCS, simply access the LCCS Developer Portal and enter your login or register. The portal is for you to manage instances of your applications, you can track the number of connections, bandwidth used etc..
Read FAQ for more details. You have a quota free and can use up to $15 per month. Very clear article it really helps..